Avocat, Trinidad and Tobago, is a village in southern Trinidad, near Fyzabad. In 1974 the Muslims of the village determined that a Mosque (a Muslim place of worship) was needed by their Jamaat (congregation). Here in first hand commentary is the narrative of the struggles of the villagers to meet this goal is recorded by Raffeek Mohammed who was the President of the Building Committee. The Masjid is pictured below. The Avocat Masjid was born out of many considerations, none of which was an object of antipathy or repugnance tn any or all creeds, to any or all Jamaats, to any or all Muslim Organisations. The quintessence of our selfless motives was to seek and reclaim the children of Islam in an area where an escalating population, particularly of young Muslims, became dormant and indifferent to Islamic culture. As a consequence, these young Muslims saw no horizons for the bettering of humanity. They were void of the weapons and the fabric of the older ones who trod the hard and ruthless road to the Massahood/Junction Masjid. Those days and that path, although looked upon now as an era of misty antiquity, gave to the older heads breadth and vigour to their character. The need, therefore, to erect a Masjid evoked a power of action and brought out a Divine spark in some of the elders of Avocat Village. This spark became brighter and more sustained by the kind generosity of Brother Hamid Ramatally and family who donated 15,000 sq. ft. of lands on which our Masjid now stands. May Allah Subhanahu-Wa-Taala bless him and may the proverbial grain of corn grow seven ears and in every ear a hundred grains so that our brother and his loved ones will live in comfort and happiness and that they wil continue to give in the cause of Islam and in the service of humanity. With the project becoming more complex and demanding, we co-opted the services of two more committee members viz. Brothers Zainool Ramjohn and Abdool Shahid. May I hammer the point here that the Building Committee was comforted from the outset by a clear unwavered pronouncement that the Avocat Jamaat would give until it hurts to see the achievement of our project. It is inspiring to note that this duty of extreme charity was discharged with credit and moral solvency by every Muslim brother and sister. Their voluntary contribution and resolute action to see the fruition of their desire is something that will long be remembered. The laying of the foundation stone was an evocation of stronger perseverence in the tasks ahead. The stone was laid in February, 1975 by our beloved Haji Shaffick-UI-Rahaman, President-General of ASJA, and assisted by other Muslim dignitaries. We sought and obtained quite readily assistance from far and wide, tapping the financial resources of our local Muslim brothers and sisters. The magnitude of the project and the price escalation element influenced our seeking financial aid from the Muslim World League of Saudi Arabia. Our efforts in this direction were well rewarded and thanks are due primarily to the Avocat Building Committee, Brother Hamid Ramatally, Haji Shaffick-Ul- Rahaman and the Ambassador to Saudi Arabia in Caracas. May Allah Bless them all. Such has been the financial glory but not less glorious were the courage, the concern, the fortitude and the endurance of the Avocat Jamaat as a whole. They toiled, laboured, rubbed shoulders together day and night, sweat and bled, became labourers and craftsmen in the process. They climbed willingly to the scaffolding to the topmost part of the Masjid without fear. That was the strength of their character. To these brothers, the Muslim people of this Jamaat and the generation to come owe a great amount of gratitude. May peace and blessings be upon them. As a Committee, we tasted several times the pangs of adversity. It was the struggle during periods of adversity that saw victory for us. If there were no difficulties, there would be no need of efforts. Thus difficulty, adversity and suffering are not all evil but often the best source of strength, discipline and virtue. Individuals are individuals and they do have a multitude of dissimilarities. The Building Committee, however, held uppermost in their minds that the welfare of the Jamaat is their welfare and so discharged their responsibilities with the highest degree of cohesion, stability and pride. Within the sphere of their own efforts and the nurturing of the Jamaat, they moved from strength to strength in their pursuit, giving new dimension and worth to the original building project. Below is the Avocat Mosque Imam’s Prayer Niche. (b) Classroom for teaching Arabic and Urdu Languages and Islamic Theology. (c) Lecture Hall for visiting Professors and Lecturers. (d) Secretariat (both regional and domestic). (e) Free boarding and lodging facilities for foreign Muslim brothers. (g) Domestic Science and Handicraft Room. 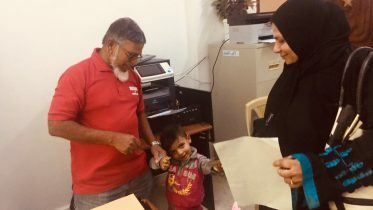 (h) Doctor’s Office for free medical aid for the poor. As you can see, it is not only a house of prayer essentially but an Islamic Centre encompassing facilities for Muslims here and all over the world. The Jamaat have spun their threads of action and of duty from day to day, week to week, over a five (5) year period, resulting in the tangible evidence of this edifice which enshrines the nobility of a great religion and a great people. The Ladies Section acted on many occasions as co-partnership of the Building Committee and excelled admirably under the Chalrladyship of Sister Sbara Baksh in providing additional funds for the furtherance and completion of ancillary projects. Their activities are pictured conditions of thoughtfulness, dedication to duty, love for Islam and above all, their concern for the realization of a Masjid to serve their younger sisters. May Allah Subhanahu-Wa-Taala shower His choicest blessings on them all. As President of the Avocat Mosque Building Committee, may I place on record that my Committee and in particular my Secretary, Brother Abdod Kadir, worked assiduously without wrangling, without anger, without idleness and that everyone did his duty with alacrity and cheerfulness. If these characteristics, should pervade withiin the Jamaat and should survive, no one and no one need despair of the future of the Avocat Masjid and the Avocat Jamaat. But if the spirit of duty, if the strength of conviction and the power of character should deaden and should be supplanted by the thirst for pleasure or selfish aggrandizement or glory, then the Avocat Masjid and its Jamaat will become pitiable and woeful in the eyes of those who laboured. We pray that the Avocat Masjid will be a source of inspiration to all Muslim Brothers and Sisters and that we will utilize it for the upliftment of Islam in this district of ours. It has not been without severe self-denial and arduous labour that this beautiful edifice has been erected and we trust and pray that it will be worthy of the sacred use for which it was designed. 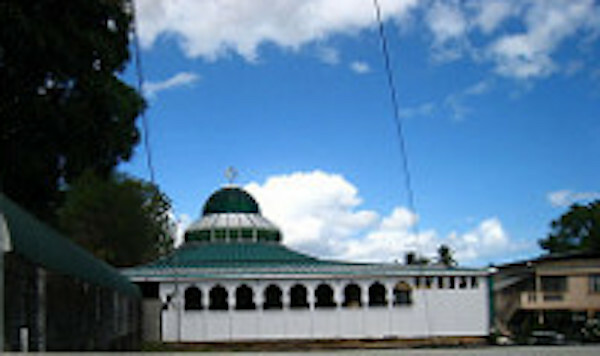 We pray that our dedication today is only the beginning of a continuous consecration of the Masjid by service and prayers of ourselves and of our generations yet unborn.May I finally express my Committee’s thanks and appreciation to the President-General of the Anjuman Sunnat-UI-Jamaat Association of Trinidad and Tobago for his personal interest and, to the Saudi Arabia Government (Muslim World League) for their financial assistance and, not less significantly, to the Muslims here and abroad and to all persons irrespective of race, colour or creed, who have in one way or another subscribed to the realization of the Avocat Masjid. We have done our duty and we praise Allah Subhanahu-Wa-Taala for this..
Be the first to comment on "The Narrative behind the building of the Avocat Masjid"